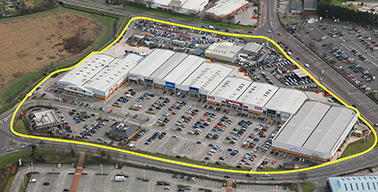 Prime retail park in the heart of the Sealand Basin retail area. Chester is the regional capital of Cheshire with an estimated population of 77,000. The park comprises seven retail units together with a drive-thru totaling 150,000 sq .ft. together with 602 car parking spaces. The property is situated at the junction of the Diva Link Road and Sealand Road to the West of Chester city centre. The property benefits from an Open A1 planning consent. The break-up and re-letting of the former JJB unit for Peacocks and Maplin. Refurbishment and re-landscaping of the car park and external areas. New elevations whilst maintaining tenants trading.